Chapter headings and selected papers: Tutorial Paper. Nonlinear input/output modeling (R.K. Pearson). Modeling and Simulation I. Systematic techniques for determining modeling requirements for SISO and MIMO feedback control problems (D.E. Rivera, S.V. Gaikwad). Dynamic simulation for integrated design and control of process flowsheets (Jianping Gong, R. Gani). Modeling and Simulation II. Low order empirical modeling for nonlinear systems (B.A. Ogunnaike et al.). Bilinear identification of nonlinear processes (J.F. Bartee, C. Georgakis). Nonlinear Control and Optimization I. On-line schedule optimization for mixed-batch/continuous plant (V.J. Terpstra et al.). Efficient computation of batch reactor control profiles under parametric uncertainty (D. Ruppen et al.). Knowledge-Based and Model-Based Control I. A genetic algorithm for MIMO feedback control system design (D.R. Lewin). Poster Papers I. Model validation test (A. Yoneya et al.). Identification of combined physical and empirical models using nonlinear A Priori knowledge (A.H. Kemna, D.A. Mellichamp). Computer-aided modelling: species topolgy (H.A. Preisig). Optimization of process systems with discontinuities (B. Pahor, Z. Kravanja). Tutorial Paper. Nonlinear model predictive control: a tutorial and survey (J.B. Rawlings et al.). Survey Paper. 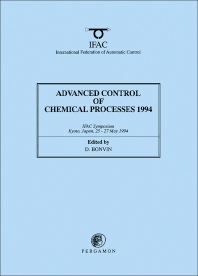 The process industry requirements of advanced control techniques: challenges and opportunities (R.S. Benson). Nonlinear Control and Optimization II. Nonlinear predictive control using local models - applied to a batch process (B.A. Foss et al.). Modeling and Simulation III. Dynamics and stability of polymerization process flowsheets using POLYRED (I. Hyanek et al.). Operation support system using dynamic simulation for a combined batch/continuous plant (H. Deguchi et al.). Nonlinear Control and Optimization III. A trust region strategy for newton-type process control (N.M.C. de Oliveira, L.T. Biegler). A practical approach to approximate input/output linearization (F.J. Doyle III). Knowledge-Based and Model-Based Control II. Fuzzy based control of a distillation plant start-up (M. Bahar et al.). Derivation of fuzzy rules for parameter free PID gain tuning (J.S. Baras, N.S. Patel). Poster Papers II. A comparison of deductive and inductive models for product quality estimation (M. Hillestad, G.O. Nesvik). Extraction of operating signatures by episodic representation (T. Fujiwara et al.). Monitoring chemical reaction systems using incremental target factor analysis (O. Prinz, D. Bonvin). Sequential control issues in the plant-wide control system (D. Hiranaka, H. Nishitani). Comparison of advanced distillation control techniques (V. Gokhale et al.). Tutorial Paper. Statistical process control of multivariate processes (J.F. MacGregor). Statistical Control Techniques I. Predictive maintenance using PCA (D.R. Lewin, Y. Harmaty). Autoassociative neural networks in bioprocess condition monitoring (J. Glassey et al.). Modeling and Simulation IV. Ill-conditionedness and process directionality - the use of condition numbers in process control (J.B. Waller et al.). Controllability analysis of SISO systems (S. Skogestad). Nonlinear Control and Optimization IV. Elementary nonlinear decoupling control of composition in binary distillation columns (J.G. Balchen, B. Sandrib). External model control of a peristaltic pump (A. Medvedev, G. Hillerstrom). Statistical Control Techniques II. Multivariate statistical process control of batch processes using PCA and PLS (J.F. MacGregor et al.). Bias detection and estimation in dynamic data reconciliation (K.F. McBrayer, T.F. Edgar). Author Index. This publication brings together the latest research findings in the key area of chemical process control; including dynamic modelling and simulation - modelling and model validation for application in linear and nonlinear model-based control: nonlinear model-based predictive control and optimization - to facilitate constrained real-time optimization of chemical processes; statistical control techniques - major developments in the statistical interpretation of measured data to guide future research; knowledge-based v model-based control - the integration of theoretical aspects of control and optimization theory with more recent developments in artificial intelligence and computer science. For process control engineers, academics specializing in the control aspects of process engineering, regulatory bodies, government laboratories.